I went to a hospital recently. Don't mistaken me, I am not sick. I am not an advocate of graphology or an expert in the field of Graphemics or Graphematics. However, I do believe that handwriting is an important means in identifying intellectual abilities, discipline and the related inner persona of a person. The invention of fountain pen was a great relief to the age-old practice of writing with quills, constantly dipping in the ink. Fountain pen have an ink reservoir in the body of the pen itself that feeds to the nib; some science of gravity and capillary action involved, although we don’t realise it fully when we use pens. Although a lot of people invented different kinds of fountain pens in different countries, it was Petrache Poenaru of Romania who received a patent from France on May 25, 1827, for the first fountain pen with a barrel. Sophisticated fountain pens were latter prepared by Safford Parker in1898, and Waterman in 1908 that gave rise to today’s pens which has a feed, generally black in colour, nib (mainly in various sizes, extra fine, fine, medium, broad) that gives the size and shape of writing and the container that holds the ink. Generally corrosion resistant materials are used to prepare the nibs. I started using ink cartridge fountain pens since 2010 and I love using it for its ease and smoothness compared to ball pens. I have few Camlin Trinity Pens. More than the smoothness, my childhood craze for pen (Freudian unconscious??) is involved in my love for fountain pens. As regards to my purchase of Parker Frontier, I was waiting for an occasion to satisfy my childhood craze and the new career growth gave an impetus and an reasonable excuse to spend few bucks on fountain pens. Coming back to the original story of vising the Pen Hospital, both the pens I bought have medium nibs and the hand writing was wide. I like thin writing which is contained and restrained. Please do not waste your time analysing the hidden meaning of my handwriting. Thinking of changing the medium nib to a fine or extra fine one I went to the Pen Doctor with my twin Parkers. 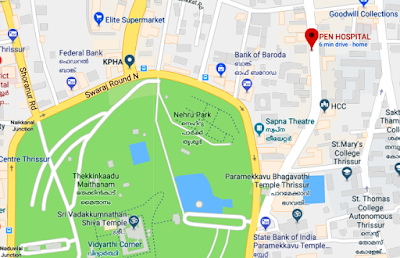 The Hospital is in Palace Road, Thrissur. 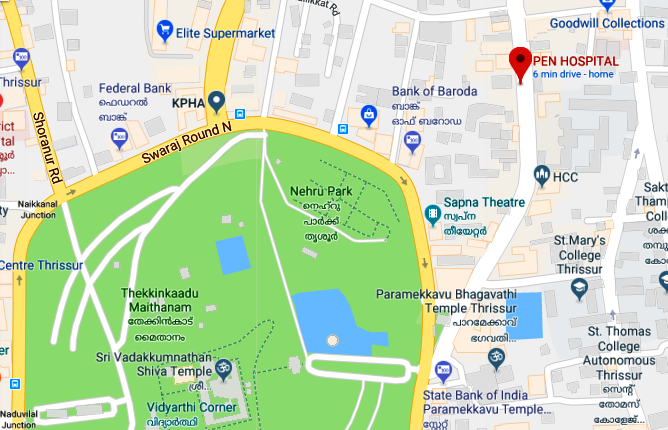 If you enter Palace Road from Paramekkavu Thrissur Round Road around the famous Vadakkunnathan Temple, it is on the left-hand side, opposite to Govt. School or Kalanikethan Ladies Show Room, before you reach Kalyan Silks. There are clusters of small shops and one among them is this hospital. The hospital did not have any sophistication of MNC or modern-day multi-specialty hospitals, just a small room less than 100sft. When I went to the hospital around 430 in the afternoon, the doctor was alone, standing in his clinic, looking for clients... I liked the privacy in the doctor’s room for my consultation. Dr.Nazar, (I suppose, I got his name correctly) the physician welcomed me gleefully with a smile that can be interpreted in many ways. The table of the doctor was filled with pens of all kinds, some good ones, fractured ones, some looked sick etc, etc… there were also few new ones kept for sale. I explained the doctor my Parker’s problem that the writing is wide and asked him to change the nib to a fine one. He had a close look at the nib and scratched on a piece of paper to understand the gravity of the sickness I was narrating to him. He took a pliers and pressed the nib and checked the nib again, had some sample writing and gave back to me. He did the same with the second pen also (while operation was going on in my parker, a man came and asked for a ball pen refill, and the doctor sold it in between). After doing two successful operations, the doctor gave me few instructions. He instructed me to Post the cap while writing (putting the cap on the end of the pen) which I don’t do. Maybe I must try it. Another piece of advice was to use the wrong side of the nib if I want still thinner letters and according to the doctor, it is oky to use both the sides. Thus, my visit to the doctor came to a happy ending.